The exact use of this intriguing embroidery is uncertain. It may have hung on a wall. Alternatively, it could have been used to cover a small table, such as a dressing table, or have been a cupboard cloth. 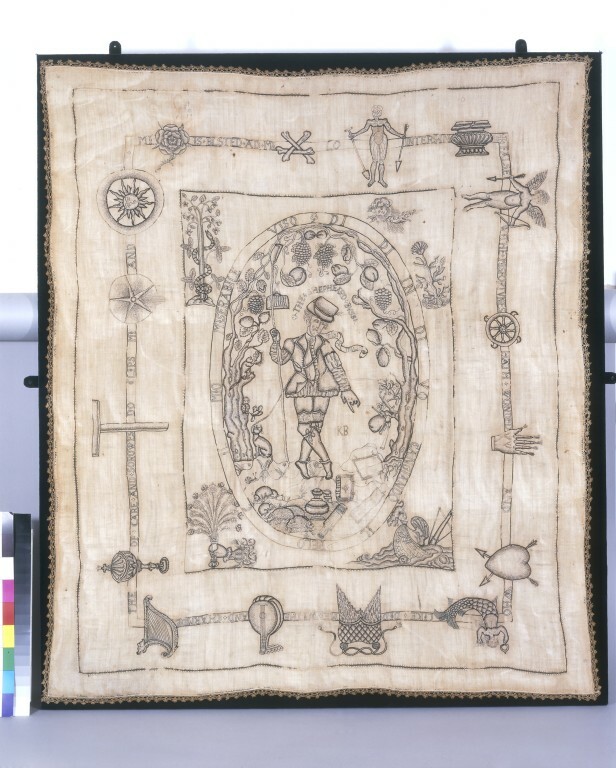 (A cupboard cloth was used on a cup-board, which took a variety of forms, but the common purpose of which was to provide a stage - or board - on which precious vessels - 'cups' - could be displayed. Such furniture was usually found in rooms where grand company dined, but could also be used in bedchambers. They originally took the form of a simple table but gradually acquired extra shelves or staging on which large quantities of plate could be shown. The number of layers could indicate the status of the owner or household. Eventually the lower part was enclosed with a door, and hence the modern word cupboard.) The embroidery may well have been a very personal piece, since the sorrows of the 'shepherd' are emphasised repeatedly in numerous forms of words, rebuses (images representing words) and emblems. 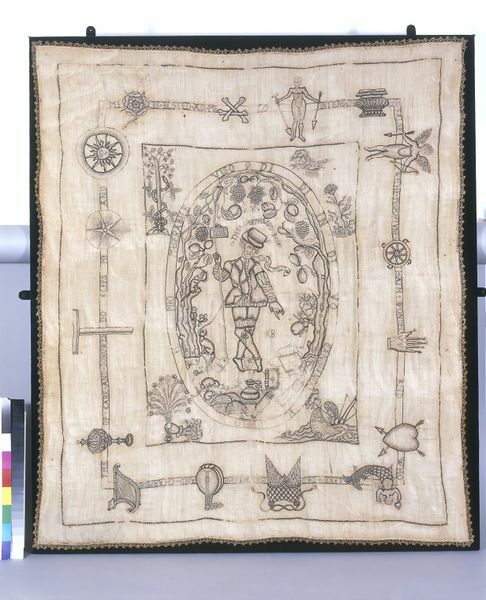 The embroidery is characteristic Elizabethan blackwork on linen of around 1600. The technique was used on both furnishings and dress. Blackwork was worked with black silk on linen, but often had accents in red silk or highlights in silver-gilt thread. The subject has never been satisfactorily explained, although each of the emblems, rebuses and mottoes relates directly to the main theme of the shepherd mourning the loss of love or a lover. A knowledge of emblems and their use in art was part of the intellectual climate of Elizabethan life. Emblem books were published in Italy and France and rather later in Britain throughout the 16th century. The best known English work was Geffrey Whitney's A Choice of Emblems, published in 1586. 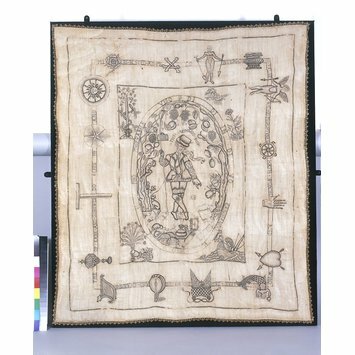 Emblems were not only important for language and literature, they also, as is evident here, left their mark on the decorative arts and embroidery. Picture of black-work embroidered linen in silk and couched cord. With a bobbin lace border. With a design of a mourning shepherd in an oval medallion in the centre surrounded by emblems and mottoes in Latin, Italian and English. The outer border also has inscriptions which are linked by symbols. The shepherd is portrayed in a melancholy attitude in a landscape flanked on both sides by a tree bearing a mixed selection of fruits. He has a small dog attached to a lead, and in his right hand is a shepherds crook which bears a purse. With his left hand he points to an open book on the ground at the foot of one of the trees, and in the lower branch there is a set of bagpipes. At his feet are flowers, a snail, several rabbits, ewes, two books, and two other objects. Discussion of the sources of the 4 'impresa' in the 4 corners of the inside square, in Peter M Daley, 'England and the Emblem: the Cultural Context of English Emblem Books', in The English Emblem and the Continental Tradition, 1988, p.1-60.